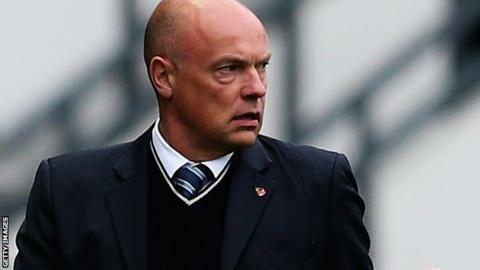 Former Wigan Athletic manager Uwe Rosler has revealed his shock at being sacked earlier this month. Rosler was dismissed after less than 12 months in charge despite the club reaching the FA Cup semi-finals and Championship play-offs last season. The Latics won just three of 17 league games this term and Rosler departed after a 3-1 derby loss at Bolton left them sitting in the relegation places. "It was a blow, it was unexpected," the 46-year-old told BBC Radio Manchester. "I know what I did well with six, seven, eight months good work - obviously the last two to three months wasn't as good. "I learnt a lot of lessons out of it and still have time to reflect and going into 2015 my aim is to come back as soon as possible." He was subsequently replaced by former Cardiff City manager Malky Mackay despite the Scot still being investigated by the Football Association after claims he sent texts of a homophobic, racist and sexist nature while at the Welsh club. Former Manchester City striker Rosler said in September that a "hangover" effect from last season had contributed to their moderate start to this campaign. But despite being sacked by Latics chairman Dave Whelan, the German said he had a good working relationship with him. "He gave me the job and then he took the job from me, but in general he's a football man and I really enjoyed working with him," added the ex-Brentford boss. "The supporters against Bolton in the first half they were singing my name, and just unfortunately it didn't work out in the end. "I was hoping to get a little bit more time but that chapter is closed now and I wish them all the best as a club."